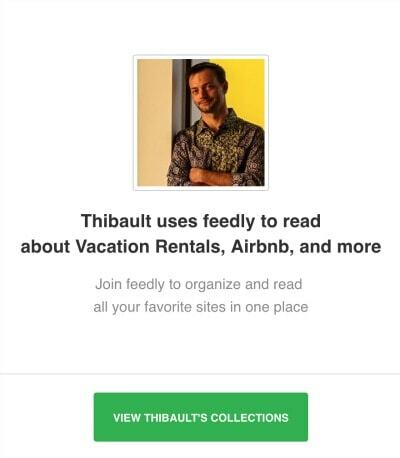 How do you keep up with vacation rental news? 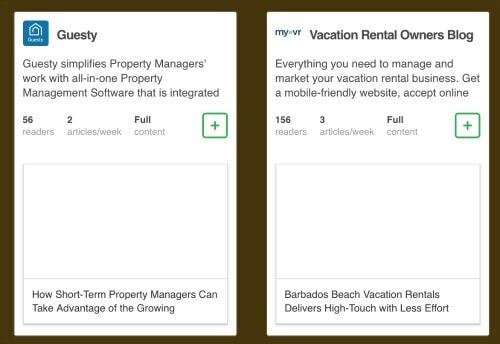 It can be crazy: There are plenty of valuable blogs around, from those of vacation rental gurus (e.g. Heather Bayer of The Vacation Rental Formula, Matt Landau from the Vacation Rental Marketing Blog), those from the big platforms (e.g. Airbnb alone has 3 distinct great blogs), those from channel managers (e.g. Guesty and Rentals United), and much more. How to keep track, get the essentials, save time, avoid the fear of missing out and get back to managing properties? Let me share with you my own collection of vacation rental blogs and news sites. They are all here, with all their feeds gathered within my own private Feedly account: https://feedly.com/tmasson . – Click on one you are interested in. You will see the latest articles from this source. The list is refreshed several times a day. You may want to open your own free Feedly account and import some of my feeds into it for a better browsing experience. I read this daily, it takes me about 15 minutes to feel well informed. And I often find super interesting gems buried within all these news feeds! Once again, the URL is https://feedly.com/tmasson . Happy browsing! I hope it helps – Let me how valuable this tip has been to you.